Sloshy sudsy floors no more, we’re zoning in on the six best tile mops for these solid, stonecold floors. The days of floor cleaning with bulky buckets and stingy, stringy mopheads are over; a vast array of methods and mechanics that have turned this formerly strenuous task into a simpler and typically more sanitary endeavor. Each household application is slightly different, and valuable functions and features also vary from user to user. We’ve targeted the best mops for the job based on some of the top needs that most mop movers seek, from a modern variation of the timeless mop bucket to a versatile steamy sanitizing machine, and from a vibrating, grime erasing automatic scrubber to simple stick mop that flows effortlessly across the floor. 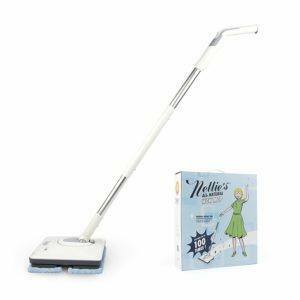 Nellie’s Wow Mop seems to solve nearly all of the aversions moppers have to the floor mopping process. This battery-powered floor cleaner does the spraying, the scrubbing, and the sanitizing. The oscillating mop pads provide powerful stain-lifting motions that combine with the absorbent mop pad material to wipe out scum and leave floors sparkling. Cordless operation allows the mop to move as swiftly as a traditional stick mop, though its motorized function adds some weight. The mop is twice the weight of a standard, manually powered version. The low-profile mop head fits under most furniture and into tight spaces, and the push button spray dispenser allows users to customize the amount of cleaner needed as they move through the floor scrubbing experience. The Nellie’s Wow Mop receives rave reviews about its ability to provide excellent results while requiring minimal effort from the user. Reports also note that the unit is easy to assemble and to operate. The pads are reported to be abrasive enough to grab ground-in grime and assist in grout-cleaning endeavors. The mop is also said to be effective on other hard floor surfaces, including laminate and hardwood. There are a handful of reviews mentioning defective units and/or longevity issues, with some mops only surviving to complete a few tile cleaning sessions before requiring repair and attention. The Nellie’s Wow Mop has a reasonably long battery life, allowing users to power scrub their tile floors for nearly an hour before a recharging session is required. A full charge takes 3-5 hours to complete. The mop’s manufacturer makes floor cleaner blends that can be used with their machine. These cleaners are well-received by Wow Mop owners and while not required for mop operation, could be worth sampling in between other commercial or homemade cleaner blends. LED headlights are located on the front of the mop and can help to expose stains and shed much-needed light on low-lying, hidden areas. Nellie’s Wow Map comes with a few accessories, including a measuring cup appropriately sized for filling the onboard cleaner holding tank. Mop pads are also included, and additional pads are available for purchase. 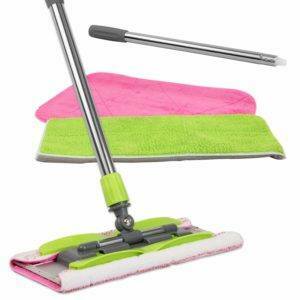 The 18” Professional Microfiber Stick Mop comes with a variety of washable mop pads made of different piles of fiber. A dry dusting pad is also included, adding a level of versatility, and can be extremely helpful when cleaning up pet-related messes like pet hair and cat litter. The pads span a sizable length of 18” which can help cut down on cleaning time. Low-profile and lightweight, the Professional Stick Mop is easy to operate and easy to store. The mop head can tuck into the lowest spaces and grab debris and dirt that often goes undetected. The handle is also light and moves fluidly during the mopping process. Owners of the Professional Microfiber Mop report good results with the washable microfiber pads, though many recommend having quite a few extra pads on hand. This allows users to have access to clean mop pads while others are in the washing and air-drying process. Multiple pads are included with the mop which should get owners off to a good start. Mop pads can be used in other household cleaning applications too, according to a few mop users. The microfiber material of the pads provides sleek and shiny results when cleaning glass, countertops, and other often streak-prone surfaces. Textured tile and grout seem to be well-scrubbed by the semi-abrasive pads, though some added pressure may be required to nab stubborn stains. The Professional Microfiber Mop has an adjustable handle and the mop head swivels, so fitting into tight spaces should be relatively easy. The handle can break, and there have been reports of it detaching from the mop head. There isn’t a scrubber material incorporated into the pads or the mop head, so users may have to utilize an added sponge or rag to address certain spots. The sleek Professional Microfiber Mop doesn’t have an onboard cleaning solution tank, so users will need to have their preferred cleaning solution ready to spray from outside of the mop. This design allows users to customize their own cleaning blends or simply sprinkle a little water in the path of the oncoming 18” cleaning pad. There have been some reports of durability issues, primarily related to the mop’s handle. The swivel function at the base of the mop head is sometimes found to be the root of the problem. Per a few reports, when customer service has been contacted about this or similar issues, users have been satisfied with the results. The Linkyo Microfiber Floor Mop is lightweight, low-profile, and it comes in at a budget-friendly price, especially considering the added accessories that come with it. It’s all about the mop pads when it comes to this sleek stick mop. The floor cleaner comes with a selection of washable mop pads that, some reversible to extend usage. You can use the pads for dry dusting in addition to wet mopping. The 14.75” wide mop head covers quite a bit of surface area and can fit into low-lying areas. The swivel function built into the mop head allows the mop to reach in tight corners, behind toilets, and along base cabinets. There isn’t an onboard cleaner reservoir, so users will need to wet and wring mop pads or apply cleaning solution blends directly to the floor they are cleaning. Once the job is done, the mop pads can head to the washing machine. Then you will have prepared them for another go-around. Most users claim that the mop seems to be sturdy and durable, overall. Some do report issues with the handle splitting, breaking, or unscrewing itself during operation. Other users cite that there seems to be a learning curve when it comes to keeping the mop head from flopping. Quite a few owners report the Linkyo Microfiber Floor Mop to be an upgrade when they compare it to other products that they’ve owned in the same price range. Many rave about the cleaning flexibility that the mop pads provide. Some users report experiencing issues with the mop pad flopping during use. There may be a slight learning curve to understanding how to maneuver the pad to prevent the flippage. Owners who’ve overcome the issue note that a combination of not enough moisture within the mop pad and too much pressure applied during the mopping motion seems to cause the trouble. This simple mop requires almost zero maintenance and has a minimal solid surface area along the mop head. This allows the mop to quickly air dry after use so you can store it almost right away. You can wash the mop pads up to 100 times before you need to replace them. So the cost of usage is also relatively low. Tension clips hold the cleaning pads in place, which not only securely holds the pads but also extends the affordability and flexibility of this mop, as users can also incorporate rags, towels, and even heavy duty paper towels in place of the microfiber mop pads. The mop’s handle isn’t adjustable, but a handle extension comes with the mop. Many users of average height report this extension to be too long for daily usage, but have found it functional to use when dry dusting and washing ceilings and walls. The Bissell PowerFresh Lift-Off Steamer Mop utilizes high temp sanitizing steam to envelop stains and dirt and is capable of removing some of the toughest stains with minimal user effort required. Grime and germs can be erased with a few sweeps of the mop pad, and the mop operator can adjust steam cycles for a custom cleaning experience every time. 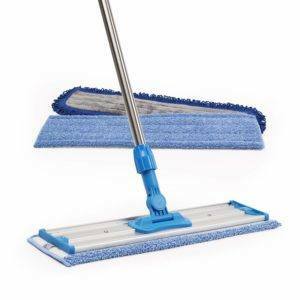 This versatile mop enables this powerful steam to mobilize with its lift-off handheld unit. This portable system pulls away from the mop’s main base and allows steam to be utilized in other cleaning applications, including sinks, showers and tubs, and greasy ovens. The cleaning capabilities of this lift-off steamer are nearly endless, and users might find themselves hoping to find more grime. And with tile usually comes grout and with grout comes dirt and microscopic debris compacted between its lines. Due to the daunting task of removing this caked in crud, many tile floor households have accepted their new accent colors of dark gray and dingy brown, and some have maybe even redecorated accordingly. Enter the power of the Lift-Off steam combined with the steamer’s grout brush attachment and those lines make their ways back to bright, clean, and slightly unrecognizable with a few swipes of the steamer (and maybe some elbow grease and a sponge if it’s been a few years or decades…no judgment here). Bissell PowerFresh owners claim to get great results when attacking old or stuck-on stains, though the mop may need to remain stationary or make a few passes over the spot to loosen it. The mop’s water tank capacity is reported to be sizable enough to produce enough steam to clean a few hundred square feet of area. Upon being refilled, the tank takes a minute or two heat the water to steam form. Some users are happy with how dry their floors remain during the steam mop cleaning process, noticing minimal moisture used to achieve the desired results. A few owners mention having issues regulating the steam at times and note that the high setting seems to be overkill for most floor applications. These users also indicate that the added steam can build up and can cause quite the puddle. Users report that the Bissell PowerFresh Lift-Off Mop can stand on its own. So if the mop needs to rest for a minute, there is minimal risk of it tipping over (and spewing steam in all directions). The water tank within the mop holds approximately 13.7 ounces of water. It can be a bit tedious to fill, as the tank isn’t removable. It’s best only to use distilled water in the mop, as it will limit the amount of mineral buildup inside the system. The PowerFresh Lift-Off Mop comes with 13 attachments and tools which can help attack hard-to-clean spots like baseboards, under refrigerators, and most glass surfaces. You can sanitize toilet bases with a few swipes of the handheld wand. You can steam, clean, and slightly straighten certain fabrics with the fabric attachment. The need for cleaning solution goes out the window when the Bissell PowerFresh is on the scene. This can leave rooms smelling clean in a hospital kind of way. You can insert scent discs into the mop to provide a fresh scent so that you can enjoy your efforts after the steaming job is done. 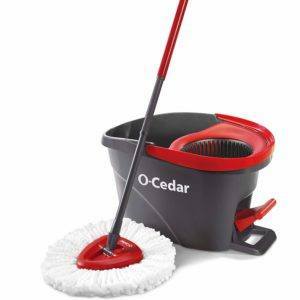 The O-Cedar EasyWring Microfiber Spin Mop allows users to tap into the long-standing tradition of cleaning floors with a sturdy mop and a bucket full of soapy suds. This combination is still one of the most functional and effective ways to conquer the job, though dirty water and slippery puddles often come with the territory. The EasyWring Spin Mop is designed to eliminate some of the headaches associated with this manual mopping method. A foot-pedal-powered spinner allows users to wring the mop head between each swipe. This pedal spin system minimizes bending and contact with dirty mop water. This high-powered wringing method, combined with the super-absorbent microfiber mop head, helps keep the mop’s moisture levels low. This means no more puddles of sludgy water pooled on the floor. As with any mop and bucket system, users can customize their cleaner solutions and modify the concentrations with each application. There is a splash guard in the system. That is to keep a lid on the bucket of soapy fun. Quite a few O-Cedar EasyWring mop owners report enjoying the easy foot-powered pedal operation of the bucket’s wringing system. However, some wish the bucket was a bit less bulky. Some users note that it can be a challenge filling the bucket due to its oblong shape. Users report that the mop head is smaller than average. This seems to be a problem for some reviewers, but a welcome change for others. Those who are fans of the size claim that the cleaning job is quicker and more thorough since the mop head is more manageable and able to fit in tighter spaces. Mop owners who’d hoped for a more robust mop head claim that cleaning time is drawn out. That is because they can’t cover as much ground. The mop head shape is beneficial when swiping along baseboards and tight corners. However, some users have said they need to have an additional rag on hand. They need it to help grab stubborn stains. There’s a sharp piece of plastic that’s part of where the mop pad meets the mop head connection. A couple of users have reported experiencing some issues with this plastic piece scraping on their floors. The O-Cedar EasyWring Spin mop handle is adjustable. The pedal function is simple enough that kids can help with the mopping job. The mop pad is washable. You can reuse it for up to 100 washes. Additional mop pads are available for purchase. The spin bucket has two parts, the main water holding area and the area where all the whirling magic happens. The sections aren’t separate, though, so dirty water will get reintroduced into the sudsy water. Some users recommend having a second bucket or sink nearby to access clean water between wrings. The adjustable, telescopic handle allows for some versatile cleaning capabilities. A dry mop head can be used in combination with the reach of the fully extended handle to dust ceilings and walls, and a little bit of moisture added to the mix can convert the mop to a wall washer. Users should take caution when operating the foot pedal if water has accumulated around the base of the bucket. The pedaling action can cause the bucket to slip, which can be a bit of a hazard. The mop and bucket combination can be a bit bulky to store. After use, some air drying may be necessary prior to sending it to its dark corner in the closet. 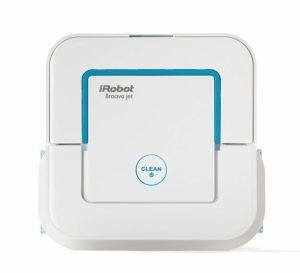 Clean floor seekers who hope to kick up their feet and let the mopping happen while they sleep can zone in on a sleek, smart robot assistant to handle the task. In the niche market of “bot mops,” there are a variety of auto moppers available. And while some offer functions and features that span from Wi-Fi control capabilities to making a simple spaghetti dinner (okay, maybe we’re not quite there yet), the iRobot Bravaa jet 240 does one thing, and it does it pretty well; it mops floors, and get owners into a nice functional mop bot for a reasonable price. The Bravaa jet 240 has three cleaning modes and automatically adjusts between them by sensing the type of cleaning pad that is inserted. Wet mopping, damp mopping, and dry dusting are the three variations, and disposable pads are available for each job. This bot mop has multiple sensors that assist in navigation, preventing the mop from heading into no-zones or attempting to mop the air on its way down the stairs. The mop is programmed to run in a pattern (its own, so resist the urge to question its destination) and can sense obstructions. The low-profile footprint of the Bravaa jet 240 fits under base cabinets, and into tight spots. In the wet mop mode, the bot will dispense water in its path, while lightly scrubbing with its vibrating mophead along the way. The mop will often go over areas several times, from slightly different angles when used in this mopping mode. According to a few owners, the iRobot Bravaa jet 240 doesn’t seem to get stuck or hung up as often as their robo vacs. These households are operating on a fully robotic tile vacuum (or hardwood vac) & mop cleaning regimen from the sounds of it, so these users have some hard data to work with. Owners report that the mop’s path can be a bit “wonky” at times, but the floors still end up satisfyingly scrubbed when the session subsides. Some users note that this bot mop is best for maintenance cleanings throughout the week and minimizes the amount of effort required when it comes to doing a whole-house deep clean. There are a handful of reports citing that the cleaning pads can bunch up during the mopping process, limiting the amount of surface area being cleaned. When this occurs, users note that upon readjustment, the mop seems ready to go for the duration of the cleaning routine. The Bravaa jet 240’s battery life is reasonable, allowing the mop to run for 2-6 hours, depending on the operating mode. The wet mop setting consumes the most amount of juice, while dry dusting seems to be a breeze for the mop. The battery can be removed from the mop bot and charged at a secondary location so the mop can be stored while the battery is regenerating itself. Disposable pads are included with the mop, though washable, reusable pads are available as an add-on purchase. While the washable pads are probably the more economical way to go, it doesn’t hurt to have a few disposable pads on hand in case you meet a stain that just needs to get tossed. The disposable mop pads can be released without contact by using the no-touch pad release. Noise can be a minor issue, especially when the mop is operating the wet mopping mode. The vibrating scrubbing function compounded with repetitive visits to the same spots can get a little loud. The damp mop and dry dust settings produce noticeably less noise. A virtual wall mode allows users to provide some boundaries for the Bravaa jet 240, so the little mopping assistant doesn’t get any ideas about making the transition over to the carpet. When weighing the options in pursuit of the best mops for tile floors, one of the best methods seems to involve a bit of reverse engineering. In order to find the top contenders, it first requires us to break down exactly what the most common complaints and aversions seem to be, related to the typically time consuming and physically taxing task of tile floor cleaning. The factors to consider when weighing the options offered on the tile mop market are fairly limited and can be broken down into a few categories. As any seasoned scum scrubber knows, taking some of the physical requirements out of the job can go a long way, and cost-of-ownership is always a consideration too. Before being able to zone in the best tile mop for the job, it’s necessary to dig deep and come to terms with what a positive tile mopping experience means. If price efficacy is a top priority, a mop with reusable pads that offers the ability to use custom cleaning solution blends might make it to the top of the list. Maneuverability and ease of use might be of the most importance. If a mop is easy to whip out, the chances are much higher that’ll it’ll see more use, more often. A mini suds fest every couple of days can go a long way when it comes to keeping the tile floors gleaming. We’ve zeroed in on the top factors used to determine the best tile mops and explored the most common variables that arise when on the path of seeking a mop that can improve the tile mopping experience. Once you have added the mop to the cleaning team, there are some costs that may incur. Most mops on the market offer washable, reusable cloth mop pads; these pads are typically the super-absorbent material of microfiber. You can wash these pads dozens of times before needing to replace them. There’s some extra maintenance involved in keeping up with these washable pads, but they can really take a bite out of the cost of operating. Disposable pads are also an option with some mops, and while they can cut way down on maintenance/washing duties, the cost of use can really add up. There are jobs that will require multiple pads to effectively complete the task. Some manufacturers offer a happy medium of sorts when it comes to pad usage options. In some cases, both disposable and washable pads are available so users can weigh the situation and alternate between the two. Cleaning solutions can really take a toll on the home maintenance budget over time. Most mops allow users the flexibility to mix their own concoctions or to create a custom cleaner from concentrate, which can help keep costs down. Mops with onboard cleaner reservoirs keep it simple to incorporate the best, most cost-effective blend for the job. Steam cleaners take cost savings to another level. Distilled water should be used in these machines, but beyond the minimal cost of the water, users can steam and sanitize their way through the task without committing to cleaning solutions. Ease of use can be a huge variable when it comes to the best mops for tile floors. The mop-and-bucket, hands-and-knees-scrubbing regimen has driven many a floor maintainers to avoid the issue for as long as possible. The ability to apply cleaning solution and scrubbing pressure while keeping upright during the mopping process can significantly increase the frequency of the mop jobs. Weight is important, especially when you need to apply some force to operate it. There are instances, however, when some added bulk can bring some added benefits. Powered oscillating scrubbers or stain-melting steam can eliminate elbow grease from the cleaning equation, but the parts and pieces required for the added functionality can add a few pounds. Corners, nooks, crannies, and crevices can all require attention at times, and a mop’s ability to navigate these tight spaces can really make a difference in the floor cleaning chore. Swivel mop heads and adjustable handles can help users attack these off-the-beaten-path regions, and can also assist when everyday obstructions like tables, chairs, and the occasional sleeping cat. While pure human energy powers most mops, some have branched off into the alternative energy realm. Batteries and corded power sources can provide some added benefits like powered scrubbing, self-propulsion, and sanitizing steam to help combat some of the more difficult floor cleaning tasks. There are some added features offered within the tile mop niche that can improve not only the tile mopping sessions but other tasks around the house. A budget-friendly mop is surely a simple system. However, even on this base level of form and function, the mop’s microfiber pads can be used to clean surfaces like glass without creating streaks. Steamers open up an entire world of cleaning potential, and when the steaming function can go mobile, the possibilities really are almost endless. When a mop can clean a floor, grout lines and all, and also do much more, the added value of function and appliance efficiency can really drive it to the top of the list. Mops with adjustable handles and extensions can bridge the gap between the floors below and the ceilings above when a dry duster or even damp cloth is incorporated into the mop head. Mop users can reach to heights formerly untouched and tackle tasks that would otherwise require several additional cleaning accessories. When weighing the options and ranking the best tile mops, there are some key variables that factor into the equation. It can be a bit daunting to sort through the details, especially when each user may value features and benefits from different perspectives. Ultimately, the rankings were established by assessing some of the most common qualifiers. Price is always a factor, and a product’s ability to perform the job for which a manufacturer designed it also ranks towards the top. Real-world mobility is important too and can help to provide the ease-of-operation that can enable users to more frequently and more efficiently complete a tile mopping session. Consumer reviews are also critical when it comes to uncovering what life is like once a mop is brought into the mix. We scanned and scoured reports from various sources to help shed light on the pros and cons of ownership. We discovered useful and hidden tidbits along the way. The upfront cost of a tile mop is important, but the added costs of ownership are also pretty key. Simple stick mops tend to be the most affordable initial investment. But if they need specific cleaners and disposable pads to function, the costs of use can pile up fast. These simple mops become more cost-effective in the long run when they offer washable mop pads and the ability to use a variety of commercial or homemade cleaning solutions. You will find some extra features in products as prices start to tick up. That frees most users from more than just physical labor. Vibrating scrubbers and pedal-powered spinners provide valuable functions. Those can really dive into solving some of the issues that can arise during a floor mopping job. So in these cases, some extra upfront expense can be justified. There are lots of features among the array of tile mops on the market. Mop heads with scrubbers, handles that rotate and extend, and buckets that do the wringing virtually themselves are some of the functions that have been incorporated into the mops we’ve encountered. There are plenty of bells and whistles to peruse on the path to the best tile floor mop. However, it’s important to consider the true purpose of the purchase. A mop that is capable of overcoming varying levels of grime while minimizing operational stress is of utmost importance. You can consider any additional options on a point-of-use basis. Once you have established a mop’s success in the floor cleaning ring, you can consider its added bonus features. 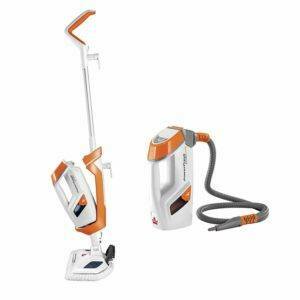 Steamers with attachments can go far when it comes to combating whole-house cleaning tasks. Robo mops can assist with dry-dusting excursions. You can modify stick mops to reach to the heights of the walls and ceilings. The weight, bulk, and build of a mop can help determine if you will be able to use, maintain, and store it. A low-profile footprint is almost always a winner. The size and shape enable users to navigate around a floor cleaning project with minimal effort. With little weight typically comes a little less function, though. So users seeking a substantially lightweight experience may need to sacrifice some features. A bot mop is possibly a winner in both the weight and the mobility category. This tiny mop can handle these two top-ranking variables right off the bat. However, it doesn’t matter much for the humans what this mopping bot weighs. Because short of the occasional relocation, bulk is of no concern. Storage requirements are often overlooked during the pursuit of a tile mop, but its a real problem sometimes, especially when buckets are involved. Once again, a sleek body style can be important in storage scenarios, and those with the added bulk took a few hits during the ranking process. Plenty of insight can be offered into a product’s true performance by delving into the array of user and consumer reviews that span various retail websites. Maintenance tips and tidbits are often mentioned in these short snippets, and users share their favorite facts and findings regarding their new-found floor cleaning friend. The sun isn’t always shining on the reviews of some of these mops, though some valuable information can be acquired, along with product failure patterns that can be picked up along the way. Reports of mop handle breakage, warranty processes, and a good read on overall customer satisfaction can be gathered from a balanced study of these reviews. What kind of maintenance can I expect with a tile mop? How can microfiber improve cleaning results? What are the pros and cons of using homemade cleaners? What features might be worth considering? Due to the simplistic nature of a standard tile mop, maintenance tends to be minimal. You can wash a reusable mop pad between 75-100 times before needing to replace it. Most manufacturers recommend their pads be washed at certain temperatures. Typically, that is without the presence of bleach or other stain-removing chemicals. You should air-dry the pads to preserve their form and function. So it may be worth it to have a few extras on hand. It is important to dry mop heads, without pads, thoroughly prior to being placing them in storage locations. Most mops don’t retain much water beyond that of which is helpful in the microfiber mop pad. So this task is simple and doesn’t take much time to complete. Distilled water should be used whenever possible in tile mops with water or cleaner dispensing mechanisms. This can help to prevent clogging mineral build-ups. Those can start to negatively impact a mop’s inner workings over time. How can microfiber material improve cleaning results? The cleaning powers of microfiber are in their microscopic makeup. A microfiber thread’s diameter is smaller than a strand of silk. In many products used for cleaning, these threads are split to further increase surface area. This design allows the material to grab tiny debris and hold onto it. It also acts as a super absorbent sponge. Moisture that a microfiber material slurps up typically doesn’t leave it. That is, unless you squeeze the pad or towel several times. This helps to keep floors as dry as possible during the mopping process. That way, cleaning can become a bit more effective. Homemade cleaners can add a customized edge to attacking various types of applications around the house. Search-engine chemists have been popping up everywhere, concocting blends and combining basic kitchen supplies to create a powerful cleaner capable of tackling some pretty serious tasks. These DIY solutions can help to limit exposure to toxic chemicals that can cause some serious side effects, both short and long-term. In some cases, at-home blends can be safe to use in areas frequented by pets and children, and these concoctions can also help keep strong chemicals out of the water supply. You can control costs a bit by using ingredients already on hand. Some people do that rather than investing in a cabinet’s worth of commercial cleaning products. You can dilute when you need to and customize scents and blends specific to each task. Vinegar is a common ingredient in many cleaning solutions due to its versatility in mixing and cleaning capabilities. However, this potent liquid may not always super effective at killing some of the meanest germs out there. Vinegar can leave a surface looking sparkly, though microscopic invaders may still be thriving and surviving on it. Sometimes, the homemade solutions offer no resolution at all. Sometimes they just can’t achieve what a strong chemical blend can. You may need to reserve these harsh blends for the most difficult of tasks. Otherwise, cleaners run the risk of wasting kitchen supplies and time. There are some pretty exciting tools and features on offer. The old hands-and-knees scrubbing technique seems to be the least favorite plan of attack. However, it still tends to be the most effective. Is freedom from scrubbing what you are seeking? If so, automatic mop bots, powered oscillating scrubbers, and targeted steam can be part of the solution. Additional tools and attachments that come with some of the steam mops can really help cut down on time it takes to eliminate gritty grout. You can use a window squeegee attachment during a window cleaning job. The murky waters of a mop bucket rank right up there with the least favorite aspects of the tile cleaning session. Modern mop manufacturers seek to eliminate, or at least improve these less than ideal conditions. They do that with the incorporation of onboard cleaner reservoirs. There are also hands-free mop pad releases, and even a foot-powered wringing system. Chemical sensitivities can cause some serious difficulties when it comes to effectively conquering a cleaning task. The desire to clean “green” also follows the path of eliminating harsh chemicals from the process. Mops with onboard solution tanks, and the traditional mop and bucket combinations offer users the flexibility to mix things up, and the steam cleaning method entirely replaces chemicals and cleaners of any sort. Lindsay is a freelance writer with an affinity for fireplace selling. She enjoys free time spent with family, friends, plants, pets and the frequent home renovation.